Introduction: Various coatings have been proposed to avoid adhesion formation to meshes and fixation devices used for intraabdominal peritoneal onlay repair (IPOM). Despite the undeniable progress of product development in the field, related complications such as ileus and pain are still frequent. Avital amniotic membrane (AM) has been used as an effective anti-adhesive coating in experimental hernia repair. However, irradiation and chemical processing to obtain an avital matrix could impair biocompatibility and anti-adhesive effects. We used human partial VITAL AM in our experiment which complies with clinical standards of product safety. Materials and Methods: 24 rats were randomized to one control or two treatment groups (n=8). An uncoated polypropylene mesh (Vitamesh®, VM) implanted in open IPOM technique and fixated with 4 sutures served as control (17 days observation period). VITAL AM was sealed with Artiss® fibrin sealant (FS) to VM, covering sutures and mesh margins in the treatment groups (observation periods: 7 and 17 days). 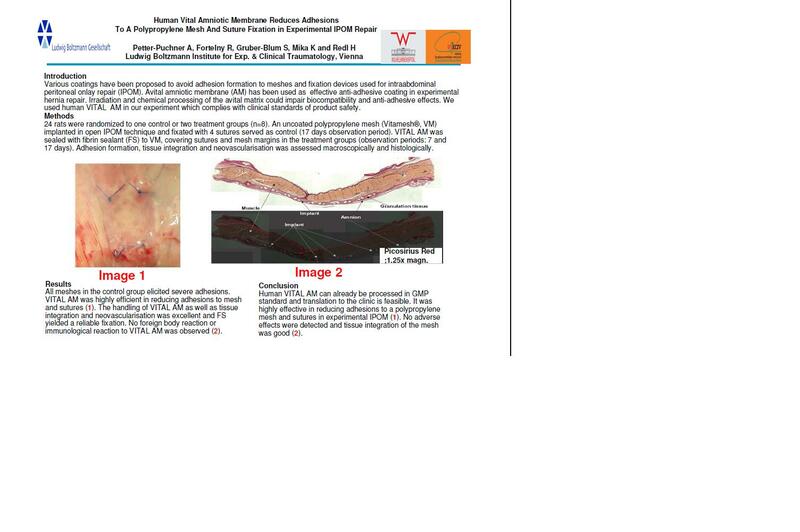 Adhesion formation, tissue integration and neovascularisation was assessed macroscopically and histologically. Results: All meshes in the control group elicited severe adhesions. VITAL AM was highly efficient in reducing adhesions to mesh and sutures. The handling of VITAL AM as well as the evoked tissue integration and neovascularisation was excellent and FS yielded a reliable fixation. No foreign body reaction or immunological reaction to VITAL AM was observed. Conclusion: Human VITAL AM was highly effective in reducing adhesions to a polypropylene mesh and sutures in experimental IPOM. No adverse effects were detected and tissue integration of the mesh seemed to be enhanced when indirectly compared with own previous results of commercially available mesh coatings.